The Battle of the Metaurus was a pivotal battle in the Second Punic War between Rome and Carthage, fought in 207 BC near the Metauro River in Italy. The Carthaginians were led by Hasdrubal Barca, brother of Hannibal, who was to have brought siege equipment and reinforcements for Hannibal. The Roman armies were led by the consuls Marcus Livius, who was later nicknamed the Salinator, and Gaius Claudius Nero. Claudius Nero had just fought Hannibal in Grumentum, some hundreds of kilometers south of the Metaurus river, and reached Marcus Livius by a forced march that went unnoticed by both Hannibal and Hasdrubal, so that the Carthaginians suddenly found themselves outnumbered. In the battle, the Romans used their numerical superiority to outflank the Carthaginian army and rout them, the Carthaginians losing 15,400 men killed or captured, including Hasdrubal. The battle confirmed Roman supremacy over Italy. Without Hasdrubal's army to support him, Hannibal was compelled to evacuate pro-Carthaginian towns in much of southern Italy in the face of Roman pressure and withdraw to Bruttium, where he would remain for the next four years. Hasdrubal's campaign to come to his brother's aid in Italy had gone remarkably well up to that point. After adeptly escaping Publius Scipio in Baecula, recruiting mercenary contingents in Celtiberia and making his way into Gaul in the winter of 208, Hasdrubal waited until the spring of 207 to make his way through the Alps and into Northern Italy. Hasdrubal made much faster progress than his brother had during his crossing, partly due to the constructions left behind by Hannibal's army a decade earlier, but also due to the removal of the Gallic threat that had plagued Hannibal during that expedition. The Gauls now feared and respected the Carthaginians, and not only was Hasdrubal allowed to pass through the Alps unmolested, his ranks were swelled by many enthusiastic Gauls. Hasdrubal, in the same fashion as his brother, succeeded in bringing his war elephants, raised and trained in Hispania, over the Alps. Rome was still reeling from the series of devastating defeats by Hannibal ten years earlier, and the Romans were terrified at the prospect of fighting two sons of "the Thunderbolt" (a rough translation of Hamilcar Barca's surname) at once. The hastily elected consuls Claudius Nero and Marcus Livius were dispatched to face Hannibal and Hasdrubal respectively. Neither consul engaged his intended target initially. Claudius Nero's force of over 40,000 men was too formidable for Hannibal to engage openly, and so the two played an unproductive game of cat and mouse in Bruttium; meanwhile, Marcus Livius, despite the added bulwark of two of the many Roman armies scattered across Italy—yielded cautiously to Hasdrubal, allowed him to push beyond the Metaurus as far south as the town of Sena, today Senigallia. It was not until Hasdrubal sent messengers to Hannibal that decisive measures were finally taken. Hasdrubal wished to meet with his brother in southern Umbria. Hasdrubal's messengers were captured, and his plans fell into the hands of the consul Claudius Nero. Nero quickly marched to the North with 7,000 men, 1,000 of whom were cavalry, in order to join up with Marcus Livius. Nero, recognizing the urgency of the situation and the enormous threat that a merging of the Carthaginian brothers' armies would present to Rome, circumvented the authority of the Senate, instead advising them to organize levies for their own protection. Horsemen were sent forward along the line of march with orders for country people to prepare supplies for soldiers, who took only weapons from the camp. Nero's troops were joined by both young and veteran volunteers during the march. Claudius Nero quickly reached Marcus Livius, who was camped at Sena along with the praetor Porcius Licinius. Hasdrubal was camped approximately a half-mile to the north. Because Claudius Nero had conveniently arrived at night, his presence was not detected until the next day, when the Romans drew themselves up for battle. Hasdrubal drew his army up as well, but upon closer observation of the forces assembled before him, noticed that Marcus Livius' army seemed to have grown considerably over the course of the night, and that he had a much larger contingent of cavalry. Hasdrubal remembered hearing a trumpet in the Roman camp heralding the arrival of an important figure the night before—a sound he had become familiar with during his entanglements with the Romans in Hispania—and correctly concluded that he was now facing two Roman armies. Fearing defeat, he retreated from the field. The rest of the day passed without event. When nightfall came, Hasdrubal quietly led his army out of his camp with the intent of retreating into Gaul, where he could safely establish communications with Hannibal. Early on in the march, Hasdrubal's guides betrayed him, and left him lost and confused along the banks of the Metaurus, searching futilely for a ford at which to cross. The night passed with no change in Hasdrubal's misfortunes, and the morning found his army disarrayed, trapped against the banks of the Metaurus, and a great many of his Gallic troops drunk. With the Roman cavalry fast approaching and the legions under the two consuls not far behind, Hasdrubal reluctantly prepared for battle. Deployment of Roman (red) and Carthaginian (blue) armies. The battle was fought at the bank of Metaurus River. The exact site of the battle is uncertain even if many academics support it happened in the today area of the common of Serrungarina. Both to the north and to the south of the river have been proposed. The exact numbers of troops on both sides are not known. The Romans estimated 8,000 Ligurians in Hasdrubal's army, making up one-third of his infantry. The data given by the ancient sources are often either insufficient or very contradictory. Appian for instance says that the Carthaginian force numbered 48,000 infantry, 8,000 cavalry and 15 elephants. Livy claims that there were 61,400 slain or captured Carthaginian soldiers at the end of the battle and there were still more who escaped the slaughter. These figures look inflated, especially given that Polybius estimated only 10,000 Carthaginian and Gallic dead. Modern estimates suggest Hasdrubal's army was about 30,000 in strength, and Marcus Livius' army of roughly equal numbers. The propraetor L. Porcius Licinius commanded two legions—as many men as the consul. This means that Marcus Livius and Porcius Licinius had between them four legions—equal to 32,000–40,000 men, including their Allies. The numbers of the allied contingents could have been less than usual due to the refusal of some of the Roman clients to provide auxiliaries. Porcius' legions were under-strength. The Roman force was probably further diminished by earlier fighting with Hasdrubal the evidence of which is the presence of 3,000 prisoners in Hasdrubal's camp. Claudius Nero's 7,000 troops were joined by perhaps 2,000 volunteers en route, and upon his arrival the Romans had 37,000 men concentrated against Hasdrubal. Like most Carthaginian armies, Hasdrubal's was a mix of many different cultures and ethnicities, including Hispanics, Ligures, Gauls and a few were of African origin. Hasdrubal's right flank was on the River Metaurus and his left flank was on inaccessible hilly terrain. He placed his cavalry on his right wing to guard it against the superior Roman cavalry that could out flank him. Contrary to this, Hasdrubal's left flank was well guarded by hills to the left and ravines in front. Hasdrubal's best troops were his Hispanic veterans, who he put in a deep formation on his right flank. The center was composed of Ligures, also deployed in deep ranks. Finally, on his left, he placed the tired Gauls on a hilltop, shielded by the deep ravine in front of them. Hasdrubal also had ten elephants, which he put up front. Marcus Livius Salinator deployed the Roman army in front of the Carthaginian force. The Roman left wing was commanded by Marcus Livius, the right wing was under Gaius Claudius Nero, facing the inaccessible Gauls, and the center was under the command of Porcius Licinius. The Roman Cavalry was placed on the left wing, facing the Carthaginian cavalry. The battle started with the Roman left flank charging the Carthaginian right, followed a little later by the advance of the Roman center. The outnumbered Carthaginian cavalry tumbled against the Roman cavalry. The Carthaginian right wing and center held their ground and the war elephants succeeded in breaking the Roman lines and spreading mass confusion. Claudius Nero, on the Roman right flank, struggled to overcome the terrain that blocked his path to the unwary Gauls on Hasdrubal's left. Seeing the futility in wasting further time attempting to reach the inert Gauls, he instead took half of his men in cohorts and led them from behind the battling Roman lines to the extreme Roman left, swinging his troops around and crashing into the Carthaginian right flank with sudden force and intensity. The Carthaginian right wing, composed of Hispanics, could not withstand this two pronged attack of Marcus Livius from the front and Claudius Nero on their flank. They were forced to fall back, taking the Ligures in the Carthaginian center with them. The elephants were running amok, killing Romans and Carthaginians alike. Hasdrubal fought alongside his men and exhorted them to keep fighting, rallying fleeing soldiers and re-starting the battle wherever he was present. The Gauls on the Carthaginian left now faced a three pronged attack: Porcius Licinius from the front, Marcus Livius from their right flank, and Claudius Nero from the rear. By now, the Roman cavalry had completely defeated the Carthaginian cavalry and, with the retreat of the Carthaginian left wing, a general retreat of Hasdrubal's army started. Six of the elephants were killed by their own drivers to stop their rampages and the remaining four captured by the Romans. Hasdrubal, seeing that there was nothing more he could do, and presumably doubtful of his own prospects of escape or simply unwilling to be taken captive, charged into the Roman ranks on his horse along with his remnant Hispanic guards and was killed. He was praised by Polybius and Livy for having done all he could as a general and then meeting a glorious death. Dexter Hoyos believes Hasdrubal's death was foolish, as he could have given organisation and leadership to the remnants of the Carthaginian army and posed a lingering threat to Rome in northern Italy. An unknown number of Ligurians and Gauls, possibly 10,000 or so, who either escaped the battle or didn't take part at all formed into an organised body but dispersed afterwards for want of a general. At least one Carthaginian officer, Hamilcar, refused to give up after Hasdrubal's defeat and organized a Cisalpine Gallic army of 40,000 men against the Romans in 200 BC. Roman left wing, center and cavalry charging the respective Carthaginian forces. Claudius Nero attacking the Carthaginian right wing at its flank, left unprotected by retreating cavalry. Carthaginian right wing and cavalry routed followed by a three prong attack on Carthaginian center. Retreat of the entire Carthaginian army. Claudius Nero showed no respect for his fallen adversary. He had Hasdrubal's head severed from his body, taken south, and thrown into Hannibal's camp as a token of his brother's defeat. The significance of the Battle of the Metaurus is recognized amongst historians. It is included in Edward Shepherd Creasy's The Fifteen Decisive Battles of the World (1851), the rationale being that it effectively removed the Carthaginian threat from Rome's ascendancy to global dominion by leaving Hannibal stranded in Italy. Paul K. Davis sees its importance as the "Carthaginian defeat ended the attempt to reinforce Hannibal, dooming his effort in Italy, and Rome was able to establish dominance over Spain." The Battle of the Metaurus is overshadowed by other battles of the Second Punic War, such as Hannibal's great victory at the Battle of Cannae or his ultimate defeat at the Battle of Zama. Nonetheless, the effects of Claudius Nero and Marcus Livius' victory at the Metaurus have earned it a significant standing amongst historians; not only of the history of Rome, but in that of the entire world. One of Hasdrubal's officers, a certain Hamilcar, stayed behind in Cisalpine Gaul after the defeat and organized a united Gallic army of 40,000 men against Rome in 200 BC, sacking the city of Placentia before being defeated and killed by Rome at the battle of Cremona. On the other hand, a part of the surviving Hispanic mercenaries continued the journey and eventually reached Hannibal. Polybius gave 10,000 killed for Hasdrubal's army and an unspecified number of prisoners. Six elephants were killed and four captured. The Romans lost 2,000 killed. Livy estimates 8,000 Roman and allied killed, possibly not contradicting Polybius, with the Carthaginians losing 56,000 killed and 5,400 captured. Livy's figure for prisoners is generally accepted by modern historians, but the number of Carthaginian deaths is not taken seriously. Total Carthaginian casualties were probably around 15,400, including 10,000 killed and 5,400 captured. A large number of Carthaginian officers were killed and many of the rest captured. F. L. Lucas's short story "The Fortune of Carthage" (Athenaeum, 28 January 1921) is about the battle's prelude, from Claudius Nero's viewpoint. It focuses on the dilemma the Roman consul faced in Apulia on intercepting Hasdrubal's letter to Hannibal. The closing section gives Hannibal's perspective in the aftermath of the battle. The story was admired by T. E. Lawrence. ^ Hoyos 2015, p. 193. ^ a b Hoyos 2015, p. 194. ^ a b c Hoyos 2015, p. 313. ^ a b c d e f g h i j k l m n o Hoyos 2015, p. 195. ^ a b c Hoyos 2003, p. 149. ^ Paul K. Davis, 100 Decisive Battles from Ancient Times to the Present: The World’s Major Battles and How They Shaped History (Oxford: Oxford University Press, 1999), 39. Florus (1889). Epitome of Roman History . Translated by John Selby Watson. London: George Bell & Sons – via Wikisource. Hoyos, Dexter (2003). Hannibal's Dynasty: Power and politics in the western Mediterranean, 247–183 BC. London: Routledge. ISBN 0-203-41782-8.
p. 235, Text n.3 (3. )"Not fewer than ten thousand Carthaginians and Gauls fell in the battle, while the Roman loss amounted to two thousand. Some of the Carthaginians of distinction were captured and the rest were slain." The Battle of Baecula was a major field battle in Iberia during the Second Punic War. Roman Republican and Spanish auxiliary forces under the command of Scipio Africanus routed the Carthaginian army of Hasdrubal Barca. Gaius Claudius Nero was a Roman general active during the Second Punic War against the invading Carthaginian force, led by Hannibal Barca. He should not be confused with the Roman Emperor Nero. During a military career that began as legate in 214 BC, he was propraetor in 211 BC during the siege of Capua, before being sent to Spain that same year. He became consul in 207 BC. The Battle of Grumentum was fought in 207 BC between Romans led by Gaius Claudius Nero, and a part of Hannibal's Carthaginian army. The battle was a minor Roman victory, and Nero marched north where he defeated and killed Hannibal's brother Hasdrubal at Metaurus. The battle is described by Livy at 27.41-42. The battle or, more precisely, the battles of Croton in 204 and 203 BC were, as well as the raid in Cisalpine Gaul, the last larger scale engagements between the Romans and the Carthaginians in Italy during the Second Punic War. After Hannibal’s retreat to Bruttium due to the Metaurus debacle, the Romans continuously tried to block his forces from gaining access to the Ionian Sea and cut his eventual escape to Carthage by capturing Croton. The Carthaginian commander struggled to retain his hold on the last efficient port which had remained in his hands after years of fighting and was ultimately successful. This is an incomplete list of battles of the Second Punic War, showing the battles on the Italian peninsula and some in Africa, in Sicily and Hispania. Battle of Lilybaeum – A Roman fleet of 20 quinqueremes defeated a Carthaginian fleet of 35 galleys. August – Hannibal conquered Catalonia. September- Hannibal defeated the Gaul Volcae tribe in the Battle of Rhone Crossing. October: Hannibal's army defeated Gauls in two battles while crossing the Alps. November: Battle of the Ticinus – Hannibal defeated the Romans under Publius Cornelius Scipio the Elder in a small cavalry skirmish. December: Battle of the Trebia – Hannibal defeated the Romans under Tiberius Sempronius Longus, who had foolishly attacked. Gnaeus Cornelius Scipio Calvus defeated Hanno in the Battle of Cissa. Iberia north of the Ebro River came under Roman control. Battle of Lake Trasimene – In an ambush, Hannibal destroyed the Roman army of Gaius Flaminius, who was killed. A Roman fleet, aided by ships from Massilia, surprised and defeated the Iberian contingent of the Carthaginian fleet in the naval Battle of Ebro River. Hannibal was trapped by Quintus Fabius in Ager Falernus, but he managed to escape in the Battle of Ager Falernus. Hannibal trapped and inflicted severe losses on a Roman army under Minucius, at the Battle of Geronium. The timely intervention of the Dictator Quintus Fabius Maximus saved the Romans from another disaster. August: Battle of Cannae – Hannibal destroyed the Roman army led by Lucius Aemilius Paullus and Gaius Terentius Varro in what is considered one of the great masterpieces of the tactical art. First Battle of Nola – Roman general Marcus Claudius Marcellus held off an attack by Hannibal. Second Battle of Nola – Marcellus again repulsed an attack by Hannibal. A Roman fleet under Titus Otacilius Crassus defeated a Carthaginian fleet near Sardinia. Hasdrubal Barca is defeated by the Scipio brothers in Battle of Dertosa. The Romans raided Carthaginian territory south of the Ebro river. A Carthaginian expedition under Hasdrubal the Bald is defeated near Caralis in Sardinia in Battle of Cornus. 214 BC – Third Battle of Nola – Marcellus fought an inconclusive battle with Hannibal. Battle of Beneventum – Tiberius Sempronius Gracchus's slave legions defeat Hanno and, therefore, deny Hannibal his reinforcements. The Siege of Syracuse begins. Hannibal, after careful planning and collaboration from the Greek populace, takes the city of Tarentum in a daring Night Raid on Tarentum. The Romans managed to hold the Citadel at the mouth of the port. First Battle of Capua – Hannibal defeated the consuls Q. Fulvius Flaccus and Appius Claudius, but the Roman army escaped. Siege of Capua temporarily lifted. Battle of the Silarus – Hannibal destroyed the army of the Roman praetor M. Centenius Penula in Campania. First Battle of Herdonia – Hannibal destroyed the Roman army of the praetor Gnaeus Fulvius in Apulia. Battle of the Upper Baetis – Publius Cornelius Scipio and Gnaeus Cornelius Scipio Calvus were killed in battle with Hasdrubal Barca. Second Battle of Capua – Hannibal was unable to break the Roman siege of the city. Second Battle of Herdonia – Hannibal destroyed the Roman army of Fulvius Centumalus, who was killed. Battle of Numistro – Hannibal defeated Marcellus once more. Battle of Sapriportis – The Tarentine Greek navy defeated a Roman squadron trying to reinforce the Citadel. Battle of Canusium – Hannibal once again confronted Marcellus in an indecisive battle. Marcellus was recalled to Rome on charges of bad leadership. Assault on Cartagena – P. Cornelius Scipio the Younger captured Cartagena, the main base of Carthage in Hispania. Battle of Baecula – Romans in Hispania under P. Cornelius Scipio the Younger defeated Hasdrubal Barca. Hasdrubal managed to save 2/3 of his army, treasures and elephants and retreat. Battle of Clupea – The Carthaginian navy is defeated in a battle off the African coast. Battle of Grumentum – Roman general Gaius Claudius Nero fought an indecisive battle with Hannibal, then marched north to confront Hasdrubal Barca, who had invaded Italy. Battle of the Metaurus – Hasdrubal Barca was defeated and killed by Livius and Nero's combined Roman army. Is thought by many as one of the most decisive battles in history. Naval Battle of Utica – A Carthaginian fleet of 70 ships is defeated by a Roman fleet of 100 ships near Utica. 206 BC – Battle of Ilipa – Scipio destroyed the remaining Carthaginian forces in Hispania. 204 BC – Battle of Crotona – Hannibal fought a drawn battle against the Roman general Sempronius in Southern Italy. 203 BC – Battle of Bagbrades – Romans under Scipio defeated the Carthaginian army of Hasdrubal Gisco and Syphax. Hannibal was recalled to Africa. Battle of Castra Cornelia – Carthaginian fleet under Hasdrubal plunders the Roman supply convoy sailing to resupply Scipio's army in Africa near Utica. 202 BC – Battle of Zama – Scipio Africanus Major decisively defeated Hannibal in North Africa, ending the Second Punic War. The Battle of Cissa was part of the Second Punic War. It was fought in the fall of 218 BC, near the Greek town of Tarraco in north-eastern Iberia. A Roman army under Gnaeus Cornelius Scipio Calvus defeated an outnumbered Carthaginian army under Hanno, thus gaining control of the territory north of the Ebro River that Hannibal had just subdued a few months prior in the summer of 218 BC. This was the first battle that the Romans had ever fought in Iberia. 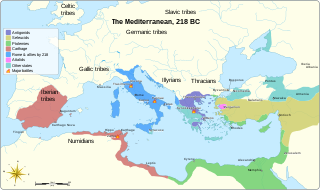 The Roman conquest of the Iberian peninsula was a process by which the Roman Republic seized territories in the Iberian peninsula that were previously under the control of native Celtiberian tribes and the Carthaginian Empire. The Carthaginian territories in the south and east of the peninsula were conquered in 206 BC during the Second Punic War. Control was gradually extended over most of the Iberian peninsula without annexations. It was completed after the fall of the Republic, by Augustus, the first Roman emperor, who annexed the whole of the peninsula to the Roman Empire in 19 BC. The peninsula had various ethnic groups and a large number of tribes.